We are dominating the faceoff circle at 63%. Only behind by one in this "epic" battle. 3rd Period Flames will show up. BP likely to mix things up a bit. He's already been doing that with the D.
Brodie with Hamonic is not a great idea. Maybe a few shifts of Kyl-Ras. 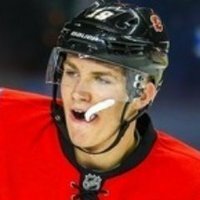 Need to mix up the Tkachuk line. Janko and Neal? Bennett-Quine and a double shifted winger? I sometimes wonder if broadcasters have some influence on the decision for coach’s challenges. No doubt Toronto is still watching and listening to the live feed, and when broadcasters make the call themselves (cough cough Louie DeBrusk) I wonder if they feel some pressure to side with their (homer) broadcasters. They actually gave the Oilers an extra percentage point. McDavid needs to pad his stats. 20 minutes to go, lots of time. First we take the lead then I’d like to see Peluso knock out Kassian’s tooth. Good start so far. Goalie interference or no goalie interference call, we’re not doing enough to be winning this game anyway. Let’s get one on the PP here boys! Come on Flames, please score a goal!!! Our PP is not the same without Gio. He is a much better point man. Brodie doesn't replace Gio for PP. Just one goal will turn around the momentum. Calgary will wake up. Late call on Bennett there. Bennett needs to be smarter than that. Taking a penalty when we are behind in the third. Bennett is taking too many dumb penalties these days. Fight with Nurse, don;t slam into the goalie. I like it. Bennett trying to get something going.....get in the goalies head. Shoot the damn puck you guys!